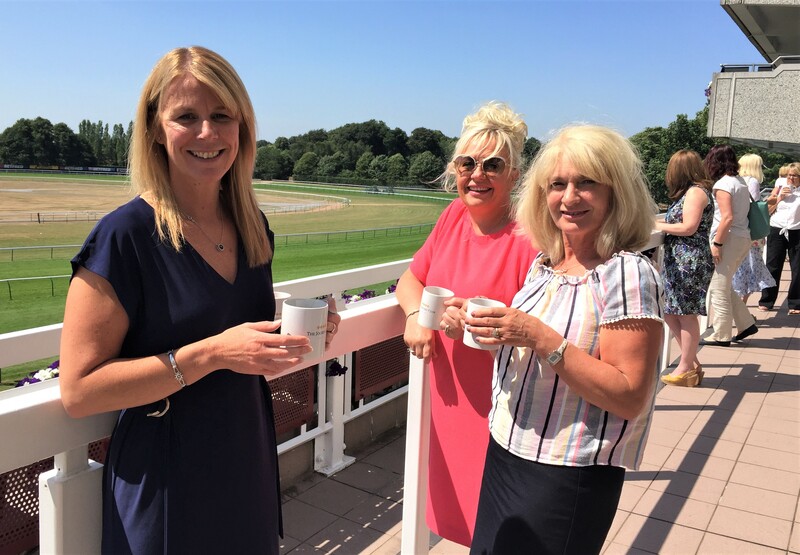 Liz Mear, Chief Executive at the North West Coast’s Innovation Agency and Health Innovation Manchester’s Chair, Ben Bridgewater, welcomed around 90 delegates involved in outpatients transformation to an NHS Improvement sponsored event at Haydock Park, Merseyside on 2 July. 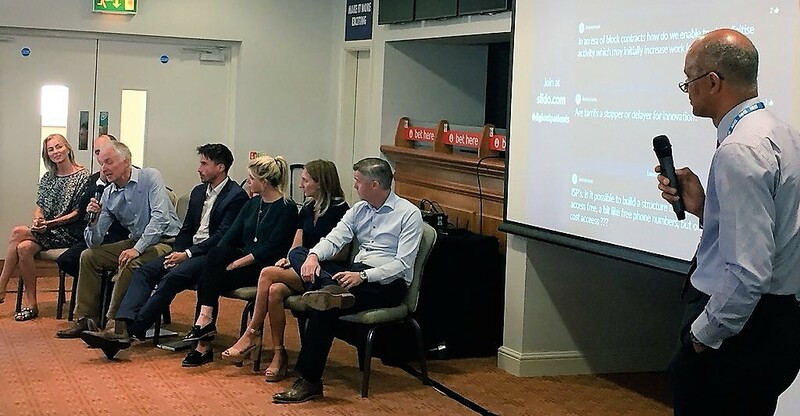 Alan Davies, Director of Digital Health at the Innovation Agency, compèred the event which attracted more than 70 NHS staff covering 29 NHS trusts across the North West. NHS England, NHS Digital, commissioning, primary care, the academic health science networks and seven industry partners were also represented. Ben Bridgewater emphasised the need to understand populations and define needs before transforming operations and building business models. Liz Mear highlighted areas of good practice including Stockport NHS Foundation Trust where virtual consultation have reduced face to face fracture clinics by 27%. Research shows 88% of patients prefer virtual appointments. 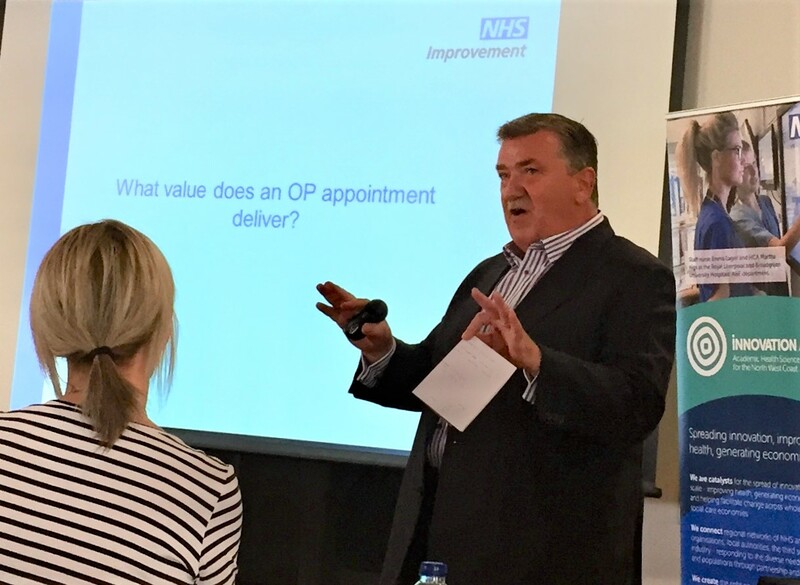 Bernard Quinn, Director of Improvement Programmes at NHS Improvement spoke about the increased demand in outpatients and the potential for digital technology to reduce growth pressure. He also touched on the national analysis and benchmarking work his team has been working on and opportunities to scale activity in the outpatient space. Bernard also mentioned a pilot he is planning to test the tariff for digital consultation. Three trusts, including two Global Digital Exemplars, a charity and a public experience group presented at the plenary session. 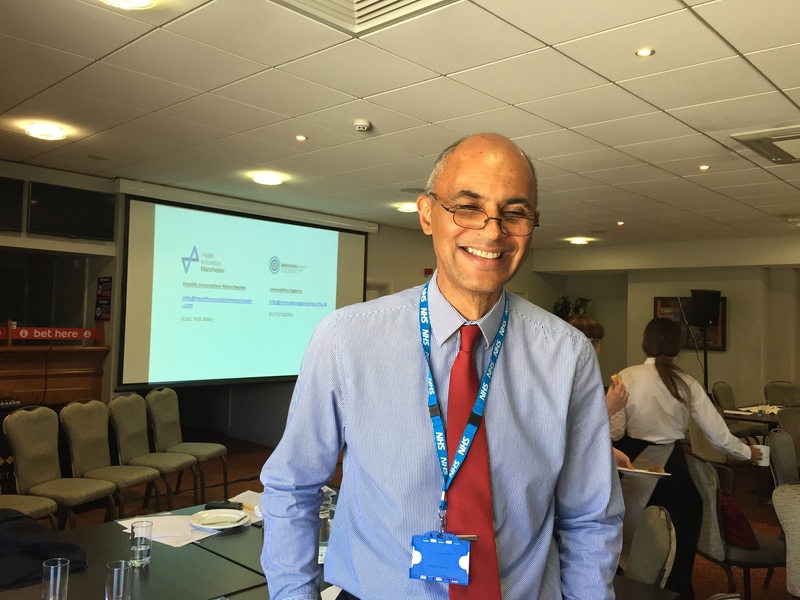 Peter Almond, Senior Project Manager at Mersey Care described the organisation’s use of telehealth to support patients with the long term conditions of chronic obstructive pulmonary disease, heart failure and type 2 diabetes. Telehealth enables early supported discharge, remote monitoring, education and self care. The trust also uses technology to select and refer patients to the telehealth team. Dr Andrew Hill from St Helen’s and Knowsley Teaching Hospitals NHS Trust described how telehealth enables six-month follow-up appointment with a nurse post stroke. Telehealth has reduced ‘did not attend’ (DNA) rates from an average of four per clinic, to one per clinic. Mike Turner, Programme Director, at Salford Royal NHS Foundation Trust gave on overview of the trust’s multiple digital projects, from core activity such as self-booking appointments, to future digital activity including artificial-intelligence driven population health, to 3D printing. Nick Filer from Health Innovation Manchester’s Public Experience Group described the value of involving patients at every stage along the innovation pathway from feasibility to communications; patients are “your critical friend,” he said. Stan Burridge, Project Lead at Pathway, gave an interactive session focused on inclusion among homeless people and rough sleepers. The charity uses a creative approach to help people access health services by providing basic mobile phones to remind them about their appointments. Delegates worked together in groups to discuss, share ideas and problem solve various themes in outpatients, including referrals, appointments, wayfinding, information gathering and dissemination, remote consultation and portals. Using real-time polling, delegates posed questions to industry partners during the industry insights session. Companies included Docobo, Healthcare Communications Ltd, Healthy.io, InHealthcare, Malinko Software, and Patient Knows Best. Julie Fidler from NHS Digital joined industry partners on the panel.